Hello everyone, from sunny, spring-y Greece. I'm here to share with you my SW603 Cocoon Cardigan from Kommatia patterns. I've been following Kommatia patterns for quite a while on social media, always admiring their work. I've never got around to make one of their patterns, so when I saw there well looking for pattern testers, I grabbed the opportunity. As it was expected their work is excellent. Beautiful drafted patterns and really interesting designs! 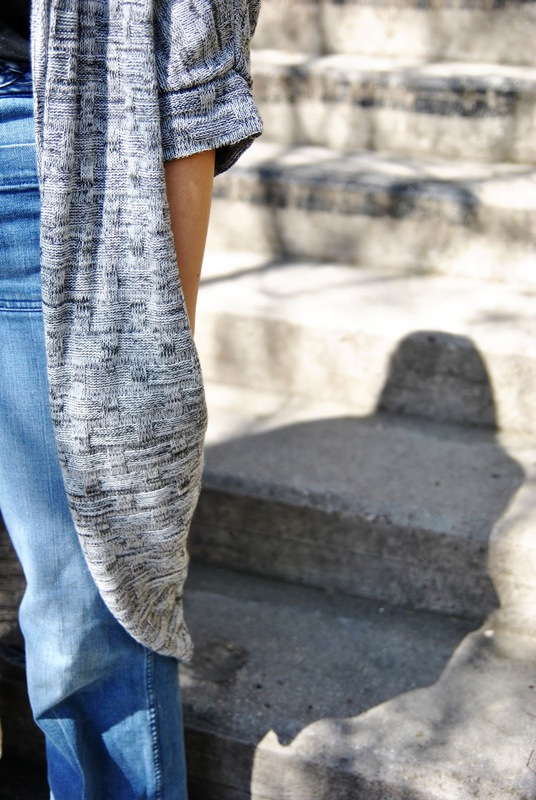 The SW603 Cocoon Cardigan is the perfect spring garment in my opinion. Long and cosy, but also airy. It has a kimono sleeve with a wide sleeve band and inseam pockets. I sewed a size M in a soft sweater knit. I love the length of the cardigan and the fact that the pattern includes pockets. I sewed the whole cardigan with my serger and the whole process from printing to finishing took about 3 hours! I love the final outcome and I can't wait to try more Kommatia patterns!